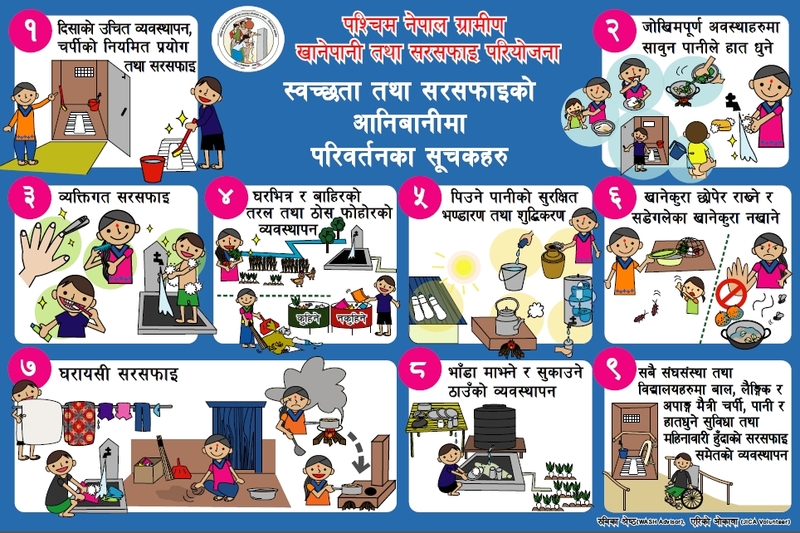 A municipality in western-central Nepal has been the first in the country to achieve Total Behaviour Change (TBC) in Hygiene and Sanitation. TBC refers to a set of water, sanitation and hygiene behaviours and practices that lead to long term community health improvements. Dana VDC (Village Development Committee) in Myagdi District was declared to have achieved TBC in Hygiene and Sanitation on 14 August, 2013. Certification was awarded by the District Water, Sanitation and Hygiene Coordination Committee (DWASHCC). Myagdi is one the districts covered by the Rural Water Supply and Sanitation Project in Western Nepal (RWSSP-WN), a bilateral development cooperation project funded by the governments of Nepal and Finland. RWSSP-WN has produced a training manual on Community Led Total Behavioral Change in Hygiene and Sanitation (CLTBCHS) for Nepal . The CLTBCHS methodology was originally designed for Ethiopia by the Water and Sanitation Program (WSP) and USAID’s Hygiene Improvement Project (HIP). The RWSSP-WN has just entered its second and final phase, which runs from September 2013 to September 2018. During this period the project will expand from nine to ten districts in Mid-western and Western Nepal . The 21.66 million euro project is funded by the Governments of Nepal (26%) and Finland (66%)‚ communities (7%)‚ and Village Development Committees and District Development Committees (3%). This entry was posted in Hygiene Promotion, Sanitary Facilities, South Asia and tagged behaviour change, changing behaviour, Community Led Total Behavioral Change in Hygiene and Sanitation, Nepal, Rural Water Supply and Sanitation Project in Western Nepal (RWSSP-WN). Bookmark the permalink. Oh … It is really great to know such a Good News that Dana VDC (Village Development Committee) in Myagdi District is declared to have achieved Total Behaviour Change in Hygiene and Sanitation. My heartiest Congratulation to the first Municipality in Nepal on such an achievement. It might prove to be a Success Story to be showcased during the forthcoming SACOSAN-V in Nepal. Now the main question in concern is the Sustainability. Hope, it will be sustained in true perspectives and the Rural Water Supply and Sanitation Project in Western Nepal (RWSSP-WN) will leave no stone un-turned to maintain the Behaviour Change sustained. Very good and encourages news like us. Congratulation to Dana VDC’s of Magdi People for their great achievement and hope for sustainability. Congratulations, it could be a learning for even countries likeIndia.we here are focusing on providing infrastructure for rural sanitation and development,but what Nepal has done through behavioural change is the way forward. a note of advice,after achieving the goal of change it has to be sustained, a suggestion is to now involve young children in the scheme,even if it takes some incentive programs to motivate these children’s. they are the ones who only can help in cementing the change brought about. FOCUS ON CHILDREN FOR SUSTAINABILITY.